SEATTLE – Russell Wilson has the arm. He has the legs – at least he had those, until a sprained ankle and knee in September, the first major injuries of his five-year career. He’s just now getting over those. He has the grit and the football savvy, the preparation and the leadership. Hugely successful franchise quarterbacks must have all that. But most of all, he has trust. That trust is what makes him – and the Seahawks’ offense – its best. That trust is how Seattle (6-2-1) beat the Patriots in New England last weekend. It’s how the NFC West leaders by two games intend to defeat Philadelphia (5-4) on Sunday at CenturyLink Field, Tampa Bay in Florida next week and so on over the final seven games of this regular season. “It definitely comes down to trust,” Wilson said Thursday. That trust is coach-to-player and player-to-player. Wilson and Pete Carroll went up to each other during the team’s flight home from the maddening 25-20 loss at New Orleans the night of Oct. 30. 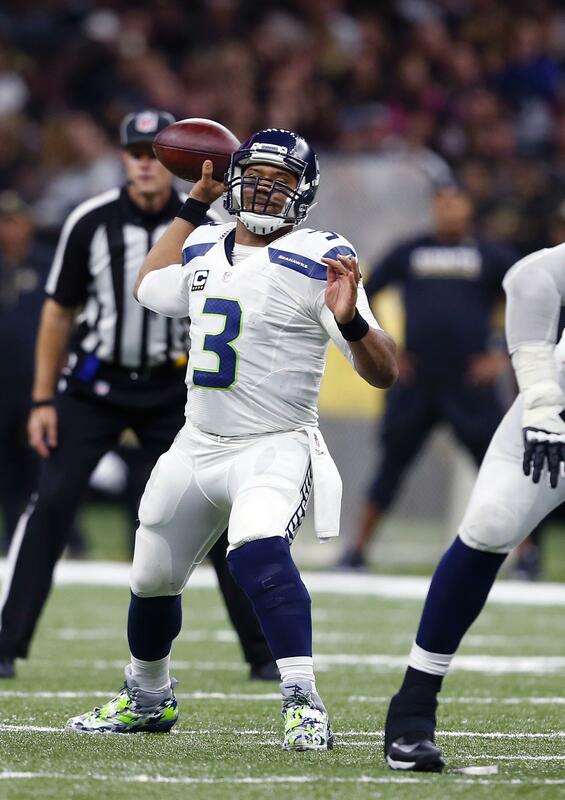 The quarterback and coach agreed on that plane to scrap the safe play calling the team had been doing to protect Wilson while he was recovering from his sprained right ankle and sprained medial collateral ligament in his left knee. Last week against New England, Wilson was running, moving, scrambling and improvising more like 2015. The offense went from puzzling to 31 points to beat the Patriots. As for player-to-player trust: One of the chief reasons for the Seahawks making four consecutive postseasons, two of the last three Super Bowls and having an estimated 95 percent chance of making the playoffs again this season is continuity. Seattle acquired 23 of the 53 players on the roster for this game with the Eagles during its 2013 or ’14 Super Bowl seasons. Yes, more than half the 2016 roster was a Seahawk for the Super Bowl two or three seasons ago. Twelve players have been on the team since at least 2012, such as Wilson and No. 1 receiver Doug Baldwin. That also includes all four starters in the defensive secondary: three-time All-Pros Richard Sherman and Earl Thomas, four-time Pro Bowl safety Kam Chancellor and cornerback DeShawn Shead. Chancellor is the NFC defensive player of the week for his hugely successful return from five weeks out with a groin strain last weekend at New England. Those dozen still with the Seahawks from 2012 or before also include dependable kicker Steve Hauschka and punter Jon Ryan. Last week Ryan broke guard Chris Gray’s record for most games played in franchise history. That trust from practicing and playing together for so long beat the Patriots last weekend. Two of Wilson’s three touchdown passes to Baldwin – all three of Seattle TDs in the win – came from an unspoken understanding between them. The first touchdown at the end of the opening half came when Wilson rolled left and looked left. Baldwin was in the middle of the field then began drifting right. Wilson knew where Baldwin was heading, away from the coverage and flow of the Patriots’ defense into an open space most quarterbacks would not look. He was 40-plus yards behind where Wilson had rolled. Yet Wilson threw all the way back across the field to the right to Baldwin, who was open from me to you. Baldwin caught the pass and backed up into the end zone uncontested. “The fact of the matter is the throw was against Football 101,” Baldwin said. “You are never supposed to throw across the field, across your body. But, knowing Russell and knowing his talents and just how smart a player he is, I know that I can find the open spot and if it’s a good spot than he will deliver the ball. Wilson’s third touchdown to Baldwin, with 4 1/2 minutes left, pushed a one-point lead to seven and came with the Patriots in man-to-man coverage. Baldwin was inside right, in the slot. He had his assigned cover man plus a snooping linebacker covering him off the line at the New England 15-yard line. Wilson threw the ball only a split second after that double coverage formed, and well before Baldwin even looked to his seam route to the end zone let alone the ball. Wilson’s pass plopped perfectly over Baldwin’s outside shoulder and into his arms in the end zone before the Patriots knew it was coming to him. Last weekend was the 14th, 15th and 16th touchdown connections between Baldwin and Wilson in the last 15 regular-season games. “Doug has been phenomenal,” Wilson said. “He’s one of the best receivers in the NFL and he does great things. The Eagles defense is tied for third in the league in points allowed at 17.8 per game, just behind Seattle’s 17.6. Last weekend Philadelphia went into man coverage 18 times on 37 pass plays against Julio Jones, Matt Ryan and what had been Atlanta’s top-rated offense and passing game. The Falcons scored just 15 points and the Eagles won by nine to snap a two-game losing streak. A subplot to Sunday’s game is whether Philadelphia will again play so much man coverage. If it does, the Seahawks believe they are uniquely equipped to combat that. Two of their three touchdowns last week at New England came against man to man. Not only do Wilson and Baldwin trust each other to beat man looks instinctively, as New England found out last weekend, Seattle has Jimmy Graham. The tight end is 6-foot-7, 260 pounds and can leap like the basketball power forward he was at the University of Miami. No one in the NFL who can match that size in man coverage. Two-man coverage, maybe. Graham had two first-half touchdowns two games ago against Buffalo, both with one arm while a Bills defender grabbed his other arm. Now Wilson trusts that Graham can make such catches whether covered or not. “I think we’re continuing to be aggressive, continuing to be smart with the ball, picking up our matchups,” Wilson said of his approach against man coverage. “Then in zone, we want to continue to carve up people. We want to be able to get first downs. We want to make plays and hit the big shot when we have the chance. Seattle’s defense may see more of a run-first, run-often approach Bellingham native and Ferndale High School graduate Doug Pederson ran as the Eagles’ head coach last weekend against the Falcons. Ryan Matthews’ and Darren Sproles’ stretch plays outside the tackles reduce the burden on rookie quarterback Carson Wentz. The No. 2 overall pick in this spring’s draft began the season 3-0 but has gone 2-4 since. Philadelphia is 1-4 on the road, the only win in week two 29-14 at woeful Chicago. Wentz has completed 65 percent of his passes with nine touchdowns and five interceptions while starting every game. Pederson said the ageless Sproles has been Wentz’s “best friend” lately, catching passes and extending drives on check-down throws. Sproles is actually not ageless but 33. He is second on the Eagles with 33 catches, behind Jordan Matthews’ 48. The Seahawks trust they match up well. They trust that against anybody this time of the year. The Seahawks have come to believe no matter what ails them early in seasons – this one had Wilson’s limiting injuries, an iffy and shuffled offensive line, no running game and a defense that could not get off the field on third downs – they will get right, right on time, late in the season. Seattle enters Sunday 30-6 in November and December since Wilson became its starting quarterback from the start of his rookie season in 2012. They are 2-0 so far this November. That’s with defensive captain Kam Chancellor just getting back last weekend from a groin pull. Lead running back Thomas Rawls is returning Sunday after missing seven games with a cracked fibula. Pro Bowl defensive end Michael Bennett will miss a third consecutive game against the Eagles but is hoping to return next weekend at Tampa Bay. Starting strong-side linebacker Mike Morgan is due back from a sports-hernia surgery to play Dec. 4 against Carolina. “Yeah, we always feel like we get strong as the season goes on. There’s not too much surprise (in that),” said middle linebacker Bobby Wagner, one of those dozen who have been Seahawks since 2012 and know why to trust. “And there’s still more out there to get. We’ve still got some guys coming back. We got Kam back. We’ll get Mike Mo back. Published: Nov. 19, 2016, 5:32 p.m.